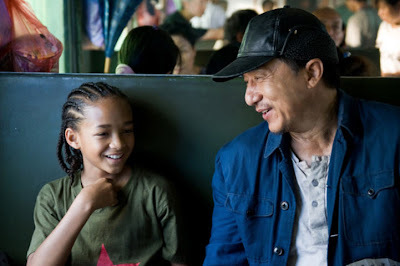 Brand new images of Jaden Smith and Jackie Chan in the new Karate Kid (or Kung Fu kid) movie have surfaced today and are shown below. The new movie stars Jaden Smith, Jackie Chan, and Taraji P. Henson. Smith plays Dre, a skateboarding video game buff who moves to China after his single mother is forced to go there for work. Unable to speak Chinese, Dre finds it hard to settle in, and gets beat up by the local bully. Chan plays Mr. Han, a maintenance man who spots his black-eye and offers to teach him both martial arts and Chinese, so he can defend against the students at the nearby school of kung-fu.